Voltage versus current characteristics for neon gas at 1 Torr pressure between flat electrodes spaced 50 cm. A-B: non-self-sustaining discharge and collection of spontaneously-generated ions. B-D: the Townsend region, where the cascade multiplication of carriers takes place. D-E: transition to a glow discharge, breakdown of the gas. E-G: transition to a normal glow; in the regions around G, voltage is nearly constant for varying current. An electric discharge is the release and transmission of electricity in an applied electric field through a medium such as a gas. The properties and effects of electric discharges are useful over a wide range of magnitudes. Tiny pulses of current are used to detect ionizing radiation in a Geiger–Müller tube. A low steady current can be used to illustrate the spectrum of gases in a gas-filled tube. 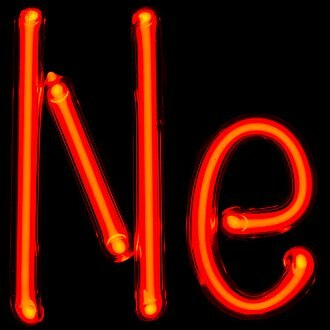 A neon lamp is an example of a gas-discharge lamp, useful both for illumination and as a voltage regulator. 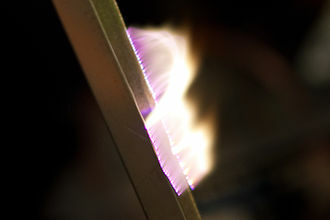 A flashtube generates a short pulse of intense light useful for photography by sending a heavy current through a gas arc discharge. Corona discharges are used in photocopiers. Electric discharges can convey substantial energy to the electrodes at the ends of the discharge. A spark gap is used in internal combustion engines to ignite the fuel/air mixture on every power stroke. Spark gaps are also used to switch heavy currents in a Marx generator and to protect electrical apparatus. In electric discharge machining, multiple tiny electric arcs are used to erode a conductive workpiece to a finished shape. 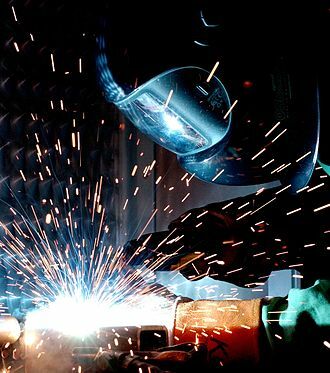 Arc welding is used to assemble heavy steel structures, where the base metal is heated to melting by the heat of the arc. An electric arc furnace sustains arc currents of tens of thousands of amperes and is used for steelmaking and production of alloys and other products. Dielectric-barrier discharge is the electrical discharge between two electrodes separated by an insulating dielectric barrier. Originally called silent discharge and known as ozone production discharge or partial discharge, on right, the schematic diagram shows a typical construction of a DBD wherein one of the two electrodes is covered with a dielectric barrier material. The lines between the dielectric and the electrode are representative of the filaments, which are normally visible to the naked eye. Below this, the shows a atmospheric DBD discharge occurring in between two steel electrode plates, each covered with a dielectric sheet. The filaments are columns of conducting plasma, and the foot of each filament is representative of the accumulated charge. The process normally uses high voltage alternating current, ranging from lower RF to microwave frequencies, other methods were developed to extend the frequency range all the way down to the DC. One method was to use a high resistivity layer to cover one of the electrodes and this is known as the resistive barrier discharge. In a common configuration, the dielectric is shaped in the same form as common fluorescent tubing. It is filled at atmospheric pressure with either a gas or rare gas-halide mix. Due to the pressure level, such processes require high energy levels to sustain. Common dielectric materials include glass, quartz and polymers, the gap distance between electrodes varies considerably, from less than 0.1 mm in plasma displays, several millimetres in ozone generators and up to several centimetres in CO2 lasers. Depending on the geometry, DBD can be generated in a volume or on a surface, for VDBD the plasma is generated between two electrodes, for example between two parallel plates with a dielectric in between. The plasma is generated on top of the surface of an SDBD plate, a particular compact and economic DBD plasma generator can be built based on the principles of the piezoelectric direct discharge. In this technique, the voltage is generated with a piezo-transformer. Since the transformer material is a dielectric, the electric discharge resembles properties of the dielectric barrier discharge. 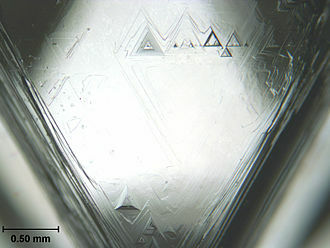 A multitude of random arcs form in operation gap exceeding 1.5 mm between the two electrodes during discharges in gases at the atmospheric pressure, as the charges collect on the surface of the dielectric, they discharge in microseconds, leading to their reformation elsewhere on the surface. Typically, a lens is used to focus the light reflected or emitted from objects into a real image on the light-sensitive surface inside a camera during a timed exposure. With an electronic sensor, this produces an electrical charge at each pixel. A negative image on film is used to photographically create a positive image on a paper base, known as a print. The word photography was created from the Greek roots φωτός, genitive of φῶς, light and γραφή representation by means of lines or drawing, several people may have coined the same new term from these roots independently. Johann von Maedler, a Berlin astronomer, is credited in a 1932 German history of photography as having used it in an article published on 25 February 1839 in the German newspaper Vossische Zeitung. Both of these claims are now widely reported but apparently neither has ever been confirmed as beyond reasonable doubt. Credit has traditionally given to Sir John Herschel both for coining the word and for introducing it to the public. Photography is the result of combining several technical discoveries, Greek mathematicians Aristotle and Euclid independently described a pinhole camera in the 5th and 4th centuries BCE. Daniele Barbaro described a diaphragm in 1566, wilhelm Homberg described how light darkened some chemicals in 1694. 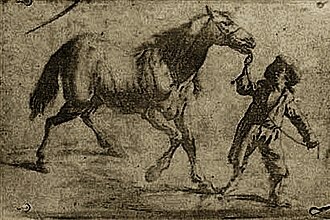 The fiction book Giphantie, published in 1760, by French author Tiphaigne de la Roche, the discovery of the camera obscura that provides an image of a scene dates back to ancient China. Leonardo da Vinci mentions natural camera obscura that are formed by dark caves on the edge of a sunlit valley, a hole in the cave wall will act as a pinhole camera and project a laterally reversed, upside down image on a piece of paper. So the birth of photography was primarily concerned with inventing means to capture, renaissance painters used the camera obscura which, in fact, gives the optical rendering in color that dominates Western Art. The camera obscura literally means dark chamber in Latin and it is a box with a hole in it which allows light to go through and create an image onto the piece of paper. Space charge is a concept in which excess electric charge is treated as a continuum of charge distributed over a region of space rather than distinct point-like charges. Space charge usually only occurs in dielectric media because in a medium the charge tends to be rapidly neutralized or screened. The sign of the charge can be either negative or positive. This situation is perhaps most familiar in the area near an object when it is heated to incandescence in a vacuum. The resulting cloud is negatively charged, and can be attracted to any nearby positively charged object, water tree is a name given to a tree-like figure appearing in a water-impregnated polymer insulating cable. However, a fraction of the carriers can be trapped at levels deep enough to retain them when the field is inverted. The amount of charge in AC should increase slower than in direct current, hetero charge means that the polarity of the space charge is opposite to that of neighboring electrode, and homo charge is the reverse situation. Under high voltage application, a charge near the electrode is expected to reduce the breakdown voltage. After polarity reversal under ac conditions, the charge is converted to hetero space charge. The reflection coefficient can be as low as 0.105 but is usually near 0.5, for Tungsten, A0 =0.6 to 1.0 ×106 A m−2 K−2, and φ =4.52 eV. At 2500 °C, the emission is 28207 A/m2, the emission current as given above is many times greater than that normally collected by the electrodes, except in some pulsed valves such as the cavity magnetron. Most of the emitted by the cathode are driven back to it by the repulsion of the cloud of electrons in its neighborhood. This is called the space charge effect, in the limit of large current densities, J is given by the Child-Langmuir equation below, rather than by the thermionic emission equation above. Space charge is an inherent property of all vacuum tubes and this has at times made life harder or easier for electrical engineers who used tubes in their designs. Those electrons are in turn accelerated and free additional electrons. The result is a multiplication that permits electrical conduction through the gas. The discharge requires a source of electrons and a significant electric field. The Townsend discharge is named after John Sealy Townsend, who discovered the fundamental ionisation mechanism by his work between 1897 and 1901, the avalanche occurs in a gaseous medium that can be ionised. The electric field and the mean path of the electron must allow free electrons to acquire an energy level that can cause impact ionisation. If the electric field is too small, the electrons do not acquire enough energy, if the mean free path is too short, the electron gives up its acquired energy in a series of non-ionising collisions. If the mean free path is too long, the electron reaches the anode before colliding with another molecule, the avalanche mechanism is shown in the accompanying diagram. The electric field is applied across a gaseous medium, initial ions are created with ionising radiation, an original ionisation event produces an ion pair, the positive ion accelerates towards the cathode while the free electron accelerates towards the anode. If the electric field is strong enough, the electron can gain sufficient velocity to liberate another electron when it next collides with a molecule. The two free electrons travel towards the anode and gain sufficient energy from the field to cause further impact ionisations. This process is effectively a chain reaction that generates free electrons, the total number of electrons reaching the anode is equal to the number of collisions, plus the single initiating free electron. Initially, the number of collisions grows exponentially, the limit to the multiplication in an electron avalanche is known as the Raether limit. 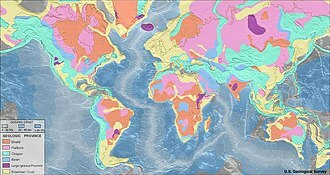 The Townsend avalanche can have a range of current densities. In common gas-filled tubes, such as used as gaseous ionisation detectors. Townsends early experimental apparatus consisted of parallel plates forming two sides of a chamber filled with a gas. A direct current high-voltage source was connected between the plates, the lower voltage plate being the cathode while the other was the anode, Townsend observed currents varying exponentially over ten or more orders of magnitude with a constant applied voltage when the distance between the plates was varied. Plasma is one of the four fundamental states of matter, the others being solid and gas. Yet unlike these three states of matter, plasma does not naturally exist on the Earth under normal surface conditions, the term was first introduced by chemist Irving Langmuir in the 1920s. However, true plasma production is from the separation of these ions and electrons that produces an electric field. Based on the environmental temperature and density either partially ionised or fully ionised forms of plasma may be produced. The positive charge in ions is achieved by stripping away electrons from atomic nuclei, the number of electrons removed is related to either the increase in temperature or the local density of other ionised matter. Plasma may be the most abundant form of matter in the universe, although this is currently tentative based on the existence. Plasma is mostly associated with the Sun and stars, extending to the rarefied intracluster medium, Plasma was first identified in a Crookes tube, and so described by Sir William Crookes in 1879. The nature of the Crookes tube cathode ray matter was identified by British physicist Sir J. J. The term plasma was coined by Irving Langmuir in 1928, perhaps because the glowing discharge molds itself to the shape of the Crookes tube and we shall use the name plasma to describe this region containing balanced charges of ions and electrons. Plasma is a neutral medium of unbound positive and negative particles. Although these particles are unbound, they are not ‘free’ in the sense of not experiencing forces, in turn this governs collective behavior with many degrees of variation. The average number of particles in the Debye sphere is given by the plasma parameter, bulk interactions, The Debye screening length is short compared to the physical size of the plasma. This criterion means that interactions in the bulk of the plasma are more important than those at its edges, when this criterion is satisfied, the plasma is quasineutral. Plasma frequency, The electron plasma frequency is compared to the electron-neutral collision frequency. Electrical breakdown or dielectric breakdown is a long reduction in the resistance of an electrical insulator when the voltage applied across it exceeds the breakdown voltage. This results in the insulator becoming electrically conductive, electrical breakdown may be a momentary event, or may lead to a discontinuous arc charge if protective devices fail to interrupt the current in a low power circuit. Under sufficient electrical stress, electrical breakdown can occur within solids, however, the specific breakdown mechanisms are significantly different for each, particularly in different kinds of dielectric medium. Electrical breakdown can occur across the insulators that suspend overhead power lines, within underground power cables. Breakdown mechanisms seem to differ in solids and gasses, breakdown is influenced by electrode material, sharp curvature of conductor material, the size of the gap between the electrodes, and the density of the material in the gap. In solid materials a long-time partial discharge typically precedes breakdown, degrading the insulators, ultimately the partial discharge chars through a channel of carbonized material that conducts current across the gap. There are several mechanisms for breakdown in liquids, small impurities. In liquefied gases used as coolants for superconductivity – such as Helium at 4.2 K or Nitrogen at 96 K – bubbles should induce breakdown, in oil-cooled and oil-insulated transformers the field strength for breakdown is about 20 kV/mm. Despite the purified oils used, small particle contaminants are blamed, thermal effects are proposed for gases by some authors, since breakdown in 50/60 Hz AC lines sometimes occurs long after the maximum voltage is reached. Electrical breakdown occurs within a gas when the strength of the gas is exceeded. Regions of intense voltage gradients can cause gas to partially ionize. This is done deliberately in low pressure such as in fluorescent lights or in an electrostatic precipitator. The voltage that leads to electrical breakdown of a gas is approximated by Paschens Law, partial electrical breakdown of the air causes the fresh air smell of ozone during thunderstorms or around high-voltage equipment. A streamer discharge, known as filamentary discharge, is a type of transient electrical discharge. Streamer discharges can form when a medium is exposed to a large potential difference. These electron avalanches create ionized, electrically conductive regions in the air near the electrode creating the electric field, the space charge created by the electron avalanches gives rise to an additional electric field. 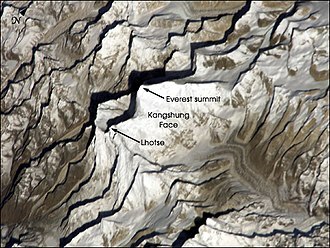 This field can enhance the growth of new avalanches in a particular direction, the ionized region grows quickly in that direction, forming a finger-like discharge called a streamer. Streamers are transient and filamentary, which makes them different from corona discharges and they are used in applications such as ozone production, air purification or plasma medicine. Streamers pave the way for arcs and lightning leaders, in which the paths created by streamers are heated by large currents. Streamers can be observed as sprites in the upper atmosphere, due to the low pressure, sprites are much larger than streamers at ground pressure, see the similarity laws below. 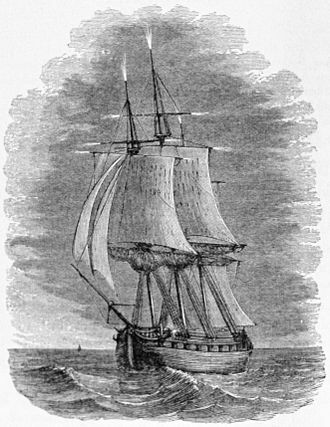 The theory of streamer discharges was preceded by John Sealy Townsends discharge theory from around 1900, however, it became clear that this theory was sometimes inconsistent with observations. This was especially true for discharges that were longer or at higher pressure, in 1939, Loeb and Raether independently described a new type of discharge, based on their experimental observations. Shortly thereafter, in 1940, Meek presented the theory of spark discharge and this new theory of streamer discharges successfully explained the experimental observations. Streamers are used in such as ozone generation, air purification. An important property is that the plasma they generate is strongly non-equilibrium, chemical reactions can be triggered in a gas without heating it. 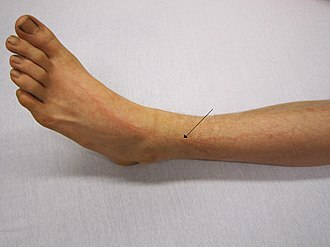 This is important for plasma medicine, where bullets, or guided streamers, can be used for wound treatment. Streamers can emerge when an electric field is applied to an insulating material. Streamers can only form in areas where the field exceeds the dielectric strength of the medium. A spark gap consists of an arrangement of two conducting electrodes separated by a gap usually filled with a gas such as air, designed to allow an electric spark to pass between the conductors. When the voltage difference between the conductors exceeds the voltage of the gas within the gap, a spark forms, ionizing the gas. An electric current flows until the path of ionized gas is broken or the current reduces below a value called the holding current. This usually happens when the drops, but in some cases occurs when the heated gas rises, stretching out. Usually, the action of ionizing the gas is violent and disruptive, often leading to sound, Spark gaps were used historically in early electrical equipment, such as spark gap radio transmitters, electrostatic machines, and X-ray machines. 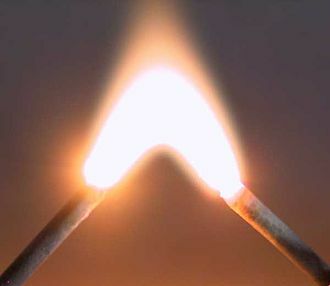 The light emitted by a spark does not come from the current of electrons itself, when electrons collide with molecules of air in the gap, they excite their orbital electrons to higher energy levels. When these excited electrons fall back to their energy levels. It is impossible for a spark to form in a vacuum. Without intervening matter capable of electromagnetic transitions, the spark will be invisible, Spark gaps are essential to the functioning of a number of electronic devices. A spark plug uses a gap to initiate combustion. The heat of the trail, but more importantly, UV radiation and hot free electrons ignite a fuel-air mixture inside an internal combustion engine, or a burner in a furnace, oven. The more UV radiation is produced and successfully spread into the combustion chamber, Spark gaps are frequently used to prevent voltage surges from damaging equipment. Spark gaps are used in switches, large power transformers, in power plants. Such switches are constructed with a large, remote-operated switching blade with a hinge as one contact, if the blade is opened, a spark may keep the connection between blade and spring conducting. Here, a Jacobs ladder on top of the switch will pull the arc apart, one might find small Jacobs ladders mounted on top of ceramic insulators of high-voltage pylons. A flashtube, called a flashlamp, is an electric arc lamp designed to produce extremely intense, full-spectrum white light for very short durations. Flashtubes are made of a length of tubing with electrodes at either end and are filled with a gas that. Flashtubes are used mostly for photographic purposes but are employed in scientific, industrial. 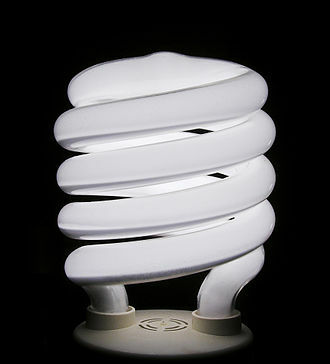 The lamp comprises a hermetically sealed tube, which is filled with a noble gas, usually xenon. 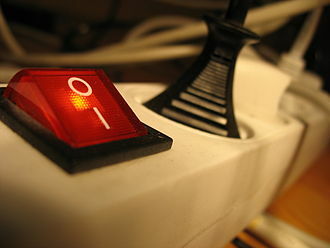 Additionally, a high power source is necessary to energize the gas as a trigger event. A charged capacitor is used to supply energy for the flash. In some applications, the emission of light is undesired, whether due to production of ozone, damage to laser rods, degradation of plastics. In these cases, a fused silica is used. 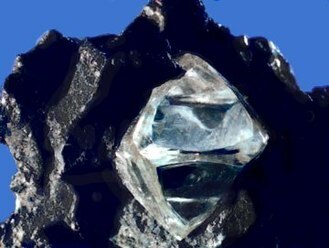 A better alternative is a cerium-doped quartz, it does not suffer from solarization and has higher efficiency and its cutoff is at about 380 nm. The power level of the lamps is rated in watts/area, total electrical input power divided by the inner wall surface. Material is removed from the workpiece by a series of rapidly recurring current discharges between two electrodes, separated by a dielectric liquid and subject to an electric voltage. One of the electrodes is called the tool-electrode, or simply the tool or electrode, while the other is called the workpiece-electrode, the process depends upon the tool and workpiece not making actual contact. This phenomenon is the same as the breakdown of a capacitor, as a result, material is removed from the electrodes. Adding new liquid dielectric in the volume is commonly referred to as flushing. Also, after a current flow, the difference of potential between the electrodes is restored to what it was before the breakdown, so that a new liquid dielectric breakdown can occur, the erosive effect of electrical discharges was first noted in 1770 by English physicist Joseph Priestley. 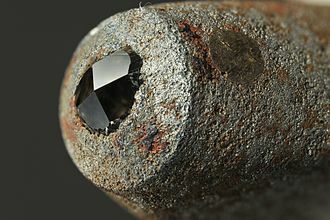 Two Russian scientists, B. R. Butinzky and N. I, were tasked in 1943 to investigate ways of preventing the erosion of tungsten electrical contacts due to sparking. They failed in this task but found that the erosion was more precisely controlled if the electrodes were immersed in a dielectric fluid and this led them to invent an EDM machine used for working difficult-to-machine materials such as tungsten. The Lazarenkos machine is known as an R-C-type machine, after the circuit used to charge the electrodes. Simultaneously but independently, an American team, Harold Stark, Victor Harding, initially constructing their machines from feeble electric-etching tools, they were not very successful. But more powerful sparking units, combined with automatic spark repetition, Stark and Beavers machines were able to produce 60 sparks per second. Later machines based on their design used vacuum tube circuits that were able to produce thousands of sparks per second, the wire-cut type of machine arose in the 1960s for the purpose of making tools from hardened steel. The tool electrode in wire EDM is simply a wire, to avoid the erosion of material from the wire causing it to break, the wire is wound between two spools so that the active part of the wire is constantly changing. Lichtenberg figures, or Lichtenberg dust figures, are branching electric discharges that sometimes appear on the surface or in the interior of insulating materials. Lichtenberg figures are associated with the progressive deterioration of high voltage components. Lichtenberg figures are now known to occur on or within solids, Lichtenberg figures are named after the German physicist Georg Christoph Lichtenberg, who originally discovered and studied them. When they were first discovered, it was thought that their characteristic shapes might help to reveal the nature of positive and negative electric fluids, in 1777, Lichtenberg built a large electrophorus to generate high voltage static electricity through induction. After discharging a high point to the surface of an insulator. By pressing blank sheets of paper onto these patterns, Lichtenberg was able to transfer and record these images and this discovery was the forerunner of the modern day science of plasma physics. 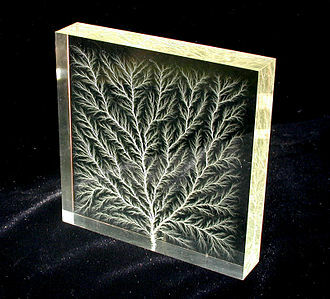 Although Lichtenberg only studied two-dimensional figures, modern high voltage researchers study 2D and 3D figures on, Lichtenberg figures are now known to be examples of fractals. 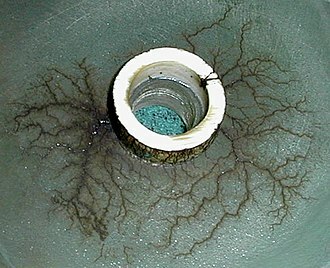 Two-dimensional Lichtenberg figures can be produced by placing a sharp-pointed needle perpendicular to the surface of a plate, such as of resin, ebonite. The point is positioned very near or contacting the plate, a source of high voltage, such as a Leyden jar or a static electricity generator, is applied to the needle, typically through a spark gap. This creates a sudden, small electrical discharge along the surface of the plate and this deposits stranded areas of charge onto the surface of the plate. These electrified areas are tested by sprinkling a mixture of powdered flowers of sulfur, during handling, powdered sulfur tends to acquire a slight negative charge, while red lead tends to acquire a slight positive charge. The negatively electrified sulfur is attracted to the positively electrified areas of the plate, if the charge areas were positive, a widely extending patch is seen on the plate, consisting of a dense nucleus, from which branches radiate in all directions. Negatively charged areas are smaller and have a sharp circular or fan-like boundary entirely devoid of branches. Heinrich Rudolf Hertz employed Lichtenberg dust figures in his seminal work proving Maxwells electromagnetic wave theories, the difference between positive and negative figures seems to depend on the presence of air, for the difference tends to disappear when the experiment is conducted in vacuum. This electrification would favor the spread of a positive, but hinder that of a negative discharge and it is now known that electrical charges are transferred to the insulators surface through small spark discharges that occur along the boundary between the gas and insulator surface. Once transferred to the insulator, these excess charges become temporarily stranded, the shapes of the resulting charge distributions reflect the shape of the spark discharges which, in turn, depend on the high voltage polarity and pressure of the gas. 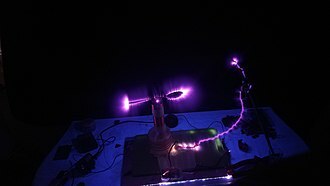 Using a higher applied voltage will generate larger diameter and more branched figures and it is now known that positive Lichtenberg figures have longer, branching structures because long sparks within air can more easily form and propagate from positively charged high voltage terminals. 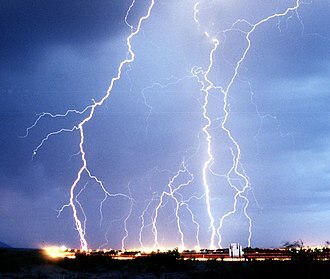 Lightning is a sudden electrostatic discharge that occurs during a thunder storm. This discharge occurs between electrically charged regions of a cloud, between two clouds, or between a cloud and the ground. The charged regions in the atmosphere temporarily equalize themselves through this discharge referred to as an if it hits an object on the ground. 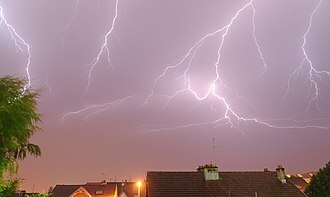 Lightning causes light in the form of plasma, and sound in the form of thunder, Lightning may be seen and not heard when it occurs at a distance too great for the sound to carry as far as the light from the strike or flash. 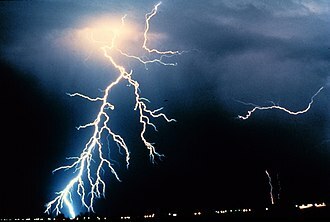 This article incorporates public domain material from the National Oceanic and Atmospheric Administration document Understanding Lightning, the details of the charging process are still being studied by scientists, but there is general agreement on some of the basic concepts of thunderstorm electrification. 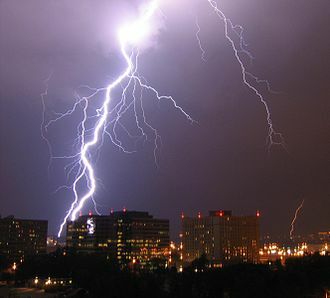 The main charging area in a thunderstorm occurs in the part of the storm where air is moving upward rapidly and temperatures range from -15 to -25 Celsius. At that place, the combination of temperature and rapid upward air movement produces a mixture of super-cooled cloud droplets, small ice crystals, the updraft carries the super-cooled cloud droplets and very small ice crystals upward. At the same time, the graupel, which is larger and denser. The differences in the movement of the precipitation cause collisions to occur, when the rising ice crystals collide with graupel, the ice crystals become positively charged and the graupel becomes negatively charged. The updraft carries the positively charged ice crystals upward toward the top of the storm cloud, the larger and denser graupel is either suspended in the middle of the thunderstorm cloud or falls toward the lower part of the storm. The result is that the part of the thunderstorm cloud becomes positively charged while the middle to lower part of the thunderstorm cloud becomes negatively charged. This part of the cloud is called the anvil. While this is the charging process for the thunderstorm cloud. 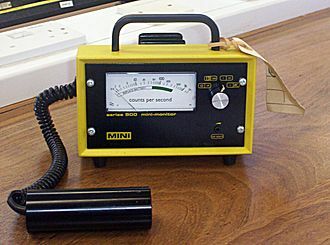 A complete Geiger counter, with the Geiger-Muller tube mounted in a cylindrical enclosure connected by a cable to the instrument. Visualisation of the spread of Townsend avalanches by means of UV photons. This mechanism allows a single ionising event to ionise all the gas surrounding the anode by triggering multiple avalanches. Unlit and lit neon lamps (NE-2 type) and their light spectrum. Germicidal lamps are simple low-pressure mercury vapor discharges in a fused quartz envelope. An integrated circuit voltage regulator in a TO-220 style package. Such devices are popular because they require few or no external components and provide the functions of pass element, voltage reference, and protection from overcurrent in one package. A voltage stabilizer using electromechanical relays for switching. Xenon flashtubes used on smartphones and cameras are usually externally triggered. Spectral outputs of various gases at the current density where visual output nearly equals IR. Krypton has very few spectral lines in the near-IR, so most energy is directed into two main peaks. Argon flashlamp spectral line radiation. The texture of the table diffracts the light, allowing the camera to image the IR lines. The switch contacts on a multimeter acting as a PCB spark gap. Master at top, badge die workpiece at bottom, oil jets at left (oil has been drained). Initial flat stamping will be "dapped", see sinking (metalworking), to give a curved surface. EDM control panel (Hansvedt machine). Machine may be adjusted for a refined surface (electropolish) at end of process. Engine driven welder capable of AC/DC welding. A diesel powered welding generator (the electric generator is on the left) as used in Indonesia. Rendering of exterior and interior of an electric arc furnace. Natural Lightning is now considered an electric spark, not electric arc. Long exposure photograph of corona discharge on an insulator string of a 500 kV overhead power line. Corona discharges represent a significant power loss for electric utilities. 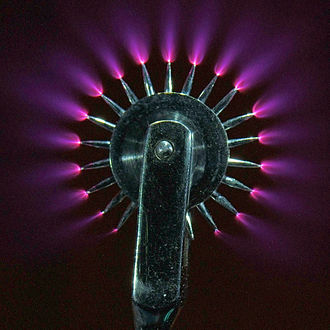 Corona discharge from a spoon attached to the high voltage terminal of a Tesla coil. 800 kV Marx generator in laboratory at the National Institute of Technology, Durgapur India. A portion of a static discharger on an aircraft. Note the two sharp 3/8" metal micropoints and the protective yellow plastic. A network card inside an antistatic bag, a bag made of a partially conductive plastic that acts as a Faraday cage, shielding the card from ESD. Lightning over Rymań. Northern Poland. 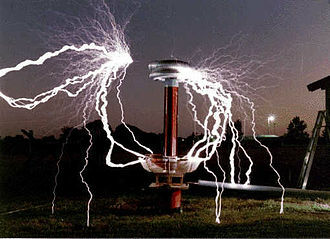 A large brush discharge from the top of a Tesla coil. Streamer discharges into the air from the high voltage terminal of a large Tesla coil. The streamers form at the end of a pointed rod projecting from the terminal. The high electric field at the pointed end causes the air to ionize there. Large Tesla coil producing 3.5 meter (10 foot) streamer arcs, indicating a potential of millions of volts. This time exposure of streamers from a Tesla coil in a glass box shows their filamentous nature. Cloud chambers are one of few ways of visualizing ionizing radiation. They were employed mainly in research in the early days of particle physics, but remain an important education tool today. A dielectric barrier discharge produced using mica sheets as dielectric, put on two steel plates as electrode. The discharge is taking place in normal atmospheric air, at about 30 kHz, with a discharge gap of about 4 mm. The "foot" of the discharge is the charge accumulation on the barrier surface. Transition from glow to arc discharge in argon, by increasing the gas pressure. Graph showing Child-Langmuir Law. S and d are constant and equal to 1.